Arthur George Francis Ross, born in Christchurch New Zealand, was the third son of Edward James and Ginny Ross (nee Cox). His father was the founding Secretary of the United Tennis, Bowls and Croquet Club and was a driving force in the formation of the New Zealand Croquet Council in 1920. He subsequently attended Christ’s College in Christchurch and took up croquet in his teens, winning his first major title, the NZ Championship Doubles, in 1915 with H.A. Penn. He was also runner up to Keith Izard in the singles championship. He fought in World War 1 where, in the latter stages, he was gassed at Ypres. His brothers were both killed in action. During his many months of convalescence at Hanmer Springs he refined his game and evolved his distinctive and memorable style before resuming play in NZ Championships in 1920, where he again won the doubles with Penn. Following recuperation he became a poultry farmer and later a schoolteacher in North Canterbury, New Zealand, a position which also required him to drive the school bus over hazardous back country roads and from which he retired in 1951. Despite that danger, his croquet success continued and he won the N.Z. Open Championship Singles 11 times, (runner-up a further 8 times), the NZ Men’s title 6 times and the British Open in 1954. In 1930 he debuted in the MacRobertson Shield World Association Croquet Team Championship, eventually representing New Zealand no less than 6 times and captained the first New Zealand team to win it in 1950. At various times he held every office on the NZ Croquet Council (President 1928-1930, Secretary 1932-1935, Vice-President and Referee 1935-1952) and started the New Zealand Croquet Council Gazette as editor, at his own expense. 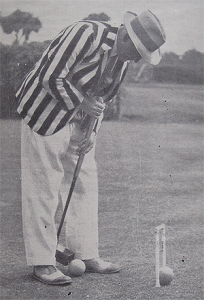 He wrote “Croquet and How to Play it” which ran to no fewer than five editions and also, due to his acknowledged international authority on the Laws of the Game, the “Powers and Duties of an Umpire” in 1946. He was actively involved in coaching around the country often finding himself battling to hold breaks together while demonstrating on some odd proportioned lawns at out of the way clubs, playing with a pipe in his mouth that he would sometimes throw to the boundary as his break became more involved. He was considered a very stylish player. He was married twice, to Violet Ross (nee Minchen) who died in 1974, and to Lena Ross (nee Ashworth) who also died in 1974. He had three sons, Hugh (b.1925, d.1992), Terence (b.1927), Peter (b.1940) and his only daughter Jean (b.1930) was at one time married to Ashley Heenan. Arthur was a wonderfully kind hearted man. When asked late in life about his croquet record he reluctantly gave the details but said that his grandchildren were his best record when he would often read stories to them without the aid of any book. He died at Motueka, New Zealand in 1975. In 1979, the Ross family and his son-in-law, Ashley Heenan presented the New Zealand Croquet Council with the Arthur Ross Memorial Trophy for the New Zealand National Handicap Event to encourage croquet at grass roots level, something Ross believed in passionately. This memorial is derived from a number of sources including the New Zealand Croquet Council, the records of Ashley Heenan and the “New Zealand Roll of Honour”. The list of Achievements has been extracted from the Croquet New Zealand Year Book and from “The History of Croquet”by D.M.C. Prichard, published by Cassell 1981.